A 21-year-old man had been experiencing coldlike symptoms with headache and fever for a week when he vomited and had a tonic-clonic seizure and was subsequently taken to a nearby emergency hospital (day 1). He had been noticing spasms on the left side of his face for 2 days. On his last visit to the hospital, he reported disorientation accompanied by fever; however, a brain MR imaging and CSF analysis showed no abnormalities. Because he was in status epilepticus on hospitalization, midazolam was administered by intravenous infusion at 3.0 mg/h. Around this time, the patient started to experience visual hallucinations and reported seeing cats and people who were not present, as well as auditory hallucinations: clicking sounds and strange voices. Brain MR imaging on day 6 indicated symmetric high-intensity lesions in the bilateral claustrum (Fig 1). CSF showed pleocytosis (59/μL, lymphocytes 36/μL, Polymorphonuclear leukocytes 23/μL) with normal protein (27 mg/dL) and sugar levels (71 mg/dL), suggesting viral encephalitis, thus the administration of acyclovir, 1500 mg/day, was started. Brain MR T2-weighted imaging (axial sections) shows high-intensity lesions of the bilateral claustrum at the sixth disease day (left). Lesions shown on T2-weighted images disappeared on day 19 (right). On day 14, he was transferred to our hospital. On arrival, he was in a confused state with high fever and neck stiffness. There was no parotitis. Visual and auditory hallucinations were observed. There was no abnormality in the cerebral nerves except for a tongue tremor of 5∼6 Hz. No pyramidal, extrapyramidal, or cerebellar symptoms or signs were observed. A blood test showed no abnormalities, with negative indication of various autoantibodies, including glutamic acid decarboxylase, anti-nuclear antibody, anti-phospholipid antibody, Ro antibody, and La antibody. Screening for influenza A and B antigens from nasal mucosa, twice for several days, was negative for both. Laboratory studies were negative for herpes simplex virus, varicella-zoster virus, cytomegalovirus, and human herpes virus 6 polymerase chain reaction (PCR) antibodies, but mumps virus PCR was positive, from which mumps encephalitis was diagnosed. Following the observation of a secondary generalization of seizures starting from the left leg, we maintained midazolam. However, an electroencephalogram revealed a slow basic rhythm with epileptic discharge. Visual and auditory hallucinations as well as tongue tremor persisted. When we administered risperidone (1 mg/day), the visual and auditory hallucinations and tongue tremor gradually improved and disappeared by day 21. A brain MR imaging on day 19 showed no lesions in the bilateral claustrum (Fig 1). By day 65, the seizures could be controlled by oral administration of an anticonvulsant (sodium valproate at 900 mg/day and phenytoin at 250 mg/day) and the patient was discharged. Two mechanisms are thought to be the cause of transient symmetric bilateral claustrum lesions. 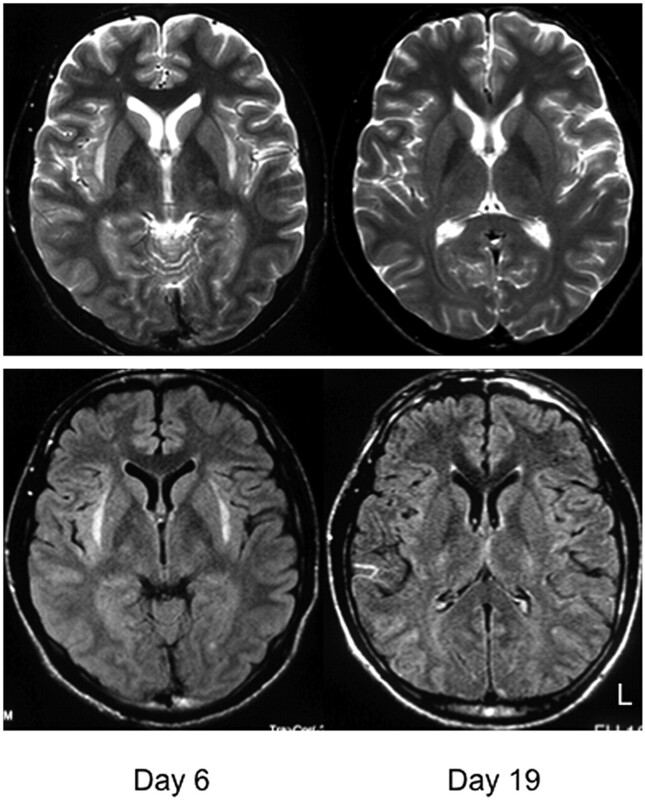 One is a postinfectious demyelination occurring during the recovery phase.1 Another is focal edema in the claustrum from seizures.2 The claustrum is relatively susceptible to seizure-induced damage.3 Although it is difficult to confirm which mechanism is involved, this case is important, at the very least, for the presence of bilateral symmetric claustrum lesions associated with mumps virus.